Vampire The Masquerade Dice Set - Games, Toys & more e.U. 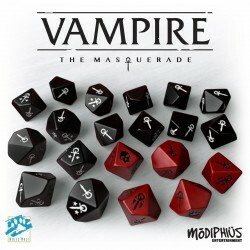 This dice set contains: A set of 20 official ten-sided dice for Vampire: The Masquerade 5th Edition. 15 black Vampire dice and 5 blood red Hunger dice. PLEASE NOTE! These dice are not required for play. The Corebook contains a guide showing how to use normal D10's.